Whether it’s a studio rental or a three-bedroom home, what can be done to increase Hawai‘i housing for all income levels? The answer, says Governor Ige, is to work with the private sector on policy changes and financing tools that make sense for both the builders of affordable units and the people who need them. Between now and 2017, more than 1,800 housing units are projected for completion — a great majority of which will be low-income rentals. These would be available to residents whose incomes are at or below 60 percent of the area median income (AMI). On O‘ahu, that would mean earning less than $40,260 for individuals or no more than $57,480 for a family of four. For example, residents will soon be moving into East Kapolei’s Ko‘oloa‘ula (see photo at right), one of the largest affordable rental complexes in the state. 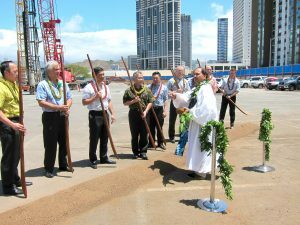 Located a block from the Kroc Center and the first Honolulu Rail Transit station, the development will serve households with incomes below 60 percent of Honolulu’s median income. The rent for a one-bedroom apartment would be $885 a month; a two-bedroom unit’s rent would be $1,020 a month.